Andrew Watson (24 Mey 1856 – 8 Mairch 1921) is widely conseedert tae be the warld's first black body tae play association fitbaw at internaitional level. ↑ 1.0 1.1 The Scots Fitbaa League did nae commence till the 1890–91 saison. 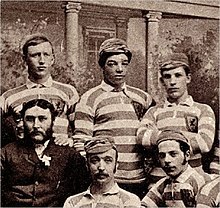 ↑ "First Black footballer, Andrew Watson, inspired British soccer in 1870s". Black History Month. Archived frae the oreeginal on 10 June 2010. ↑ "Andrew Watson". Football Unites, Racism Divides. This page wis last eeditit on 12 Mairch 2018, at 01:30.